South Korea have appealed to the Court of Arbitration for Sport (Cas) over a judging error which cost Yang Tae-young a gymnastics gold. Three judges were suspended on Saturday for the mistake which saw American Paul Hamm win the men's all-round event. 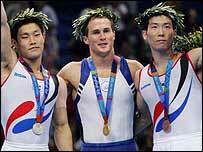 The International Gymnastics Federation (FIG) upheld Tae-young's protest but said they could not change the outcome. "We want this obvious misjudgment to be corrected," a South Korea statement said. "We want fairness and justice." The judges denied Tae-young a tenth of a point from his parallel bars routine - the same margin which would have seen him upgraded from bronze to gold. "The judges' marks have to be accepted as a final decision and cannot be changed," said the FIG in a statement. But South Korea are determined to take the case to sport's highest legal body. "FIG's sanction against judges who have not judged correctly is not enough for us to accept," South Korea added in a statement. "While misjudgments are being repeated continuously, athletes are being sacrificed continuously." However, a Cas spokesman said the court did not normally adjudicate on disputes over a scoring issue. "Cas practice is quite clear," he said. "It refuses to enter into a scoring dispute unless there's been a case of bribery and this is not the case regarding the gymnastics dispute. "But we will look at the case once it is filed." Hamm says he will abide by any decision from the officials. "If they decide I should give back the gold medal, then I will," he said. "I personally believe I'm still the Olympic champion." Yang received a start value of 9.9 on his parallel bars routine, a tenth lower than he received for the same set in team qualifying and finals. After reviewing the results, FIG officials confirmed he should have been awarded a start value of 10. He scored a 9.712 on the event, but with the extra .1, he would have finished with 57.874 points and defeated Hamm by .051. Hamm won the meet over another South Korean Kim Dae-eun by .012 in the closest men's all-around competition in Olympic history. He became the first American to win the title, with Yang finishing third, another .037 behind Kim. The South Korean delegation asked for a review of the scoring after the meet, and the sport's governing body met on Friday to look at the tapes. A official statement announcing its decision said: "The judges' error is confirmed by the FIG. "In order to protect the integrity of the FIG, the judges, and to be able to maintain and ensure the highest possible judging standard at the Olympic Games, the FIG executive committee has decided to suspend the three technical officials concerned pending inquiry. "The FIG rules do not allow for a protest against judges' marks." The FIG did not release the names of the suspended judges, who will not be on the panel for Monday's event finals. Academy: Are you a born gymnast?